Eukaryotic cells have an elaborate mechanism for adding sugar chains to their proteins. This builds an even greater diversity into the cell's proteome, expanding the possibilities that are available using amino acids encoded in the genome. 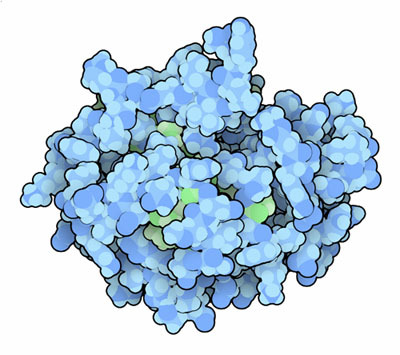 As proteins are synthesized by ribosomes, sugar molecules are added at specific locations on their surfaces. This process is so important that upwards of 1% of the genome is devoted to the process of building these carbohydrates and adding them to proteins and other molecules. The carbohydrates play many functional roles: perhaps the most familiar is in blood, where variants of carbohydrate chains on the surface of red blood cells define the A/B/O blood types. One important type of carbohydrate is added to proteins as they pass through the endoplasmic reticulum, bound for their ultimate locations inside or outside the cell. These carbohydrates are added to asparagines on the protein surface, and are thus called N-linked glycosides. These begin with a core of fourteen sugar groups linked into a branched chain, which may then be customized by further addition or removal of sugars. 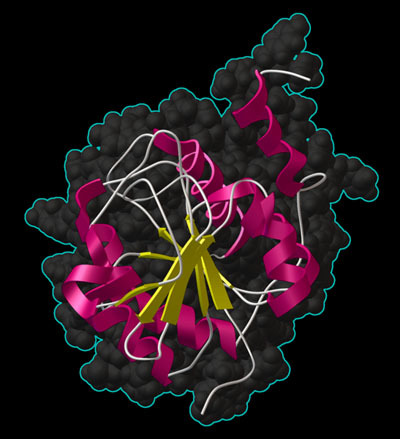 In the endoplasmic reticulum, this core carbohydrate chain is built on a dolichol molecule, which acts as a carrier as the chain is pieced together. Then, when it is finished, the whole thing is transferred to the protein. N-acetylglucosamine transferase performs the second step in the construction, adding the second sugar in the chain. The typical form of this enzyme is composed of a single protein chain with two structurally similar domains, one to hold the dolichol-sugar complex, and one to hold an activated form of the sugar that will be added. However, the enzyme in yeast is composed of two separate protein chains, termed Alg13 and Alg14, which perform these separate functions. This proved to be a boon for NMR spectroscopy, because the smaller sizes of the separate protein subunits make them amenable to structure solution. Researchers at NESG have recently solved the structure of Alg13 (shown here from entry 2jzc at the Protein Data Bank) and pinpointed the amino acids involved in its function (shown in green in the upper image). Based on the sequence prediction, Alg13 was expected to have a typical Rossman-type fold, which is often found in proteins that bind to nucleotides. When the structure was solved, however, there was a surprise. The half of Alg13 that binds to the sugar-nucleotide donor does adopt the expected fold, but the other half was quite different. In fact, the fold of this half is different from anything seen in other glycosyltransferases that have been studied. This may be due to the unique functional constraints imposed by the need for Alg13 to cooperate with Alg14 in its reaction. The Jmol image below shows the similarity of Alg13 with one domain of the more typical glycosyltransterase MurG (PDB entry 1nlm). 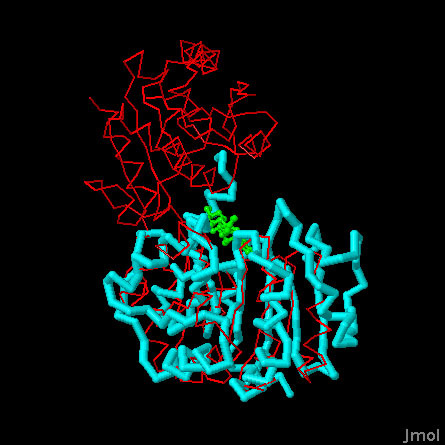 Alg13 (turquoise) is overlapped with the C-terminal domain of the bacterial enzyme MurG (red). The MurG structure includes a sugar-nucleotide donor bound in the active site, shown here in green. Use the buttons below to flip between different representations of the structures, and to highlight the two beta sheets in Alg13 that are different than the typical glycosylase fold. Wang, X., Weldeghiorghis, T., Zhang, G., Imperiali, B., Prestegard, J. H. (2008) Solution structure of Alg13: the sugar donor subunit of a yeast N-acetylglucosamine transferase. Structure 16, 965-975. Breton, C., Snajdrova, L., Jeanneau, C., Koca, J., Imberly, A. (2006) Structures and mechanisms of glycosyltransferases. Glycobiology 16, 29R-37R. Coutinho, P. M., Deleury, E., Davies, G. J., Henrissat, B. (2003) An evolving hierarchical family classification for glycosyltransferases. J. Mol. Biol. 328, 307-317.